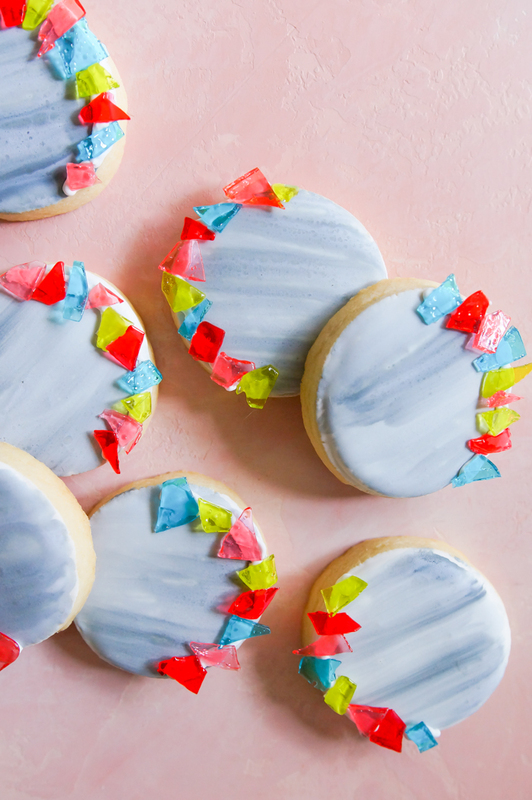 I've made weird cookies before. The walrus cookies of 2012. The Xanadu cookies (apparently I'm the only person to admit to loving Xanadu). That time I tried making Don Draper cookies and they ended up looking exactly like Mitt Romney. 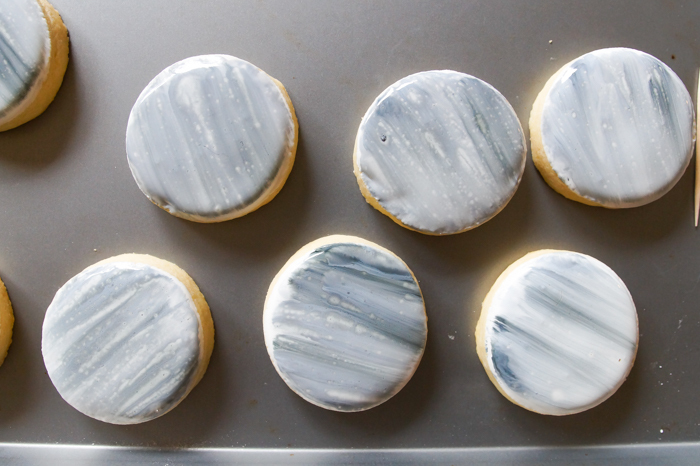 Well, these cookies are more abstract than on-the-nose. Mr. E, knowing what they represent, said they're like cookies to take to a support group. He's not wrong. 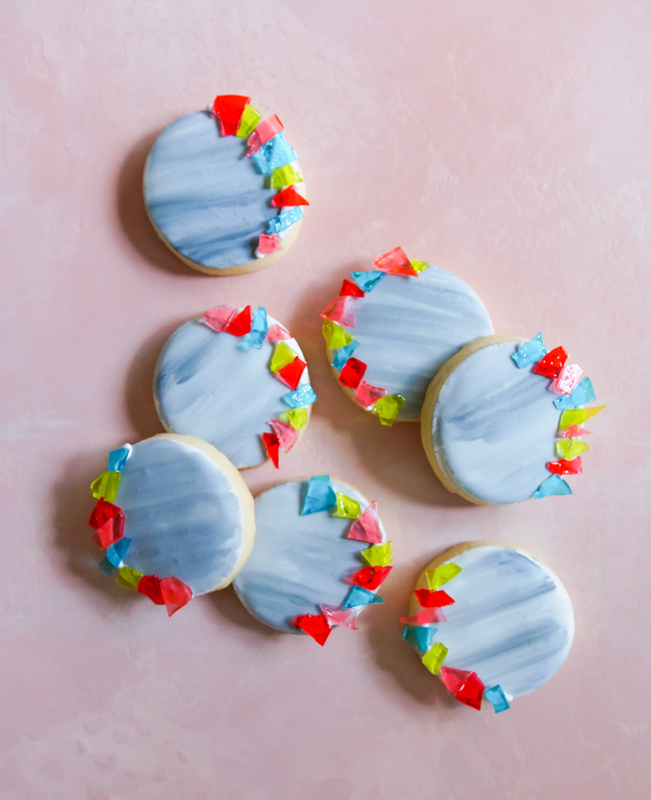 These cookies are my representation of...a migraine headache aura. Yep, I told you. WEIRD. Luckily, I've only had three migraine headaches in my life. How do you know you're having a migraine? You want to detach your head from your body. (Not to be dramatic, but migraines are no joke.) My heart goes out to all of you who have them regularly. An hour or so later came the crushing headache and nausea. And for the ONE AND ONLY time in my life, googling symptoms actually told me something of value. I googled "headache and nausea," and the first result that came up was Migraine: headache, nausea, light aura. WHAT? Ding, ding, ding! Last time I saw that aura, I didn't put it together with the headache. 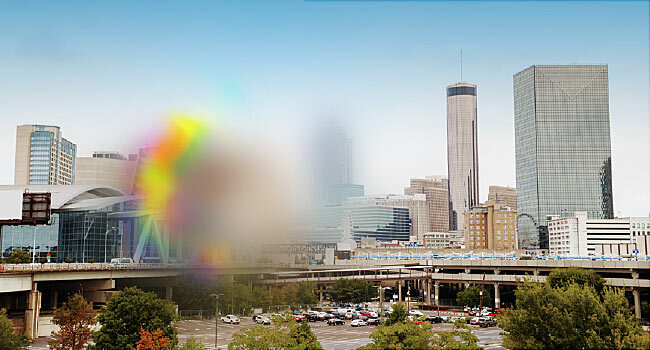 People can see different things - squiggly lines, big patches of grey, flashes of light, or none at all. Mine looked almost exactly like this. Almost like a kaleidescope. Anyway, my cookie brain went to work and I immediately wanted to cookie this thing. I don't know why. Maybe it's time for an intervention. Maybe I have too much time on my hands now that I'm an empty-nester. For the base of the cookie, I used royal icing as usual and dipped the cookies instead of outlining and filling, like I did here on the emoji cookies. The cookies dried overnight. 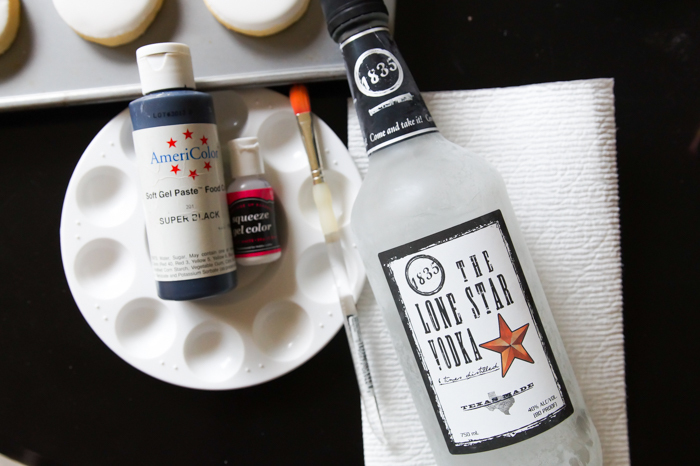 Once completely dry, I mixed white food coloring with just a touch of black food coloring and a little vodka. I also made a mixture that was just vodka and black food coloring. 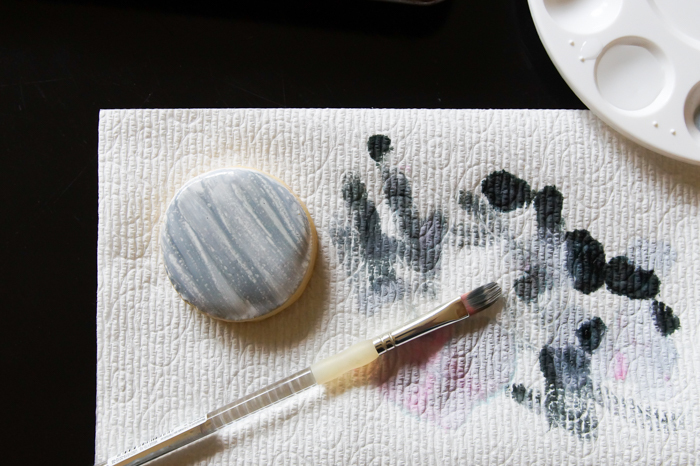 Using a flat brush, I dipped into the lighter grey "paint" and blotted it on a paper towel. I painted the entire cookie. Next, I dipped a tiny edge of the brush in the black paint and brushed it over for variation in the shades. This will dry in about an hour. 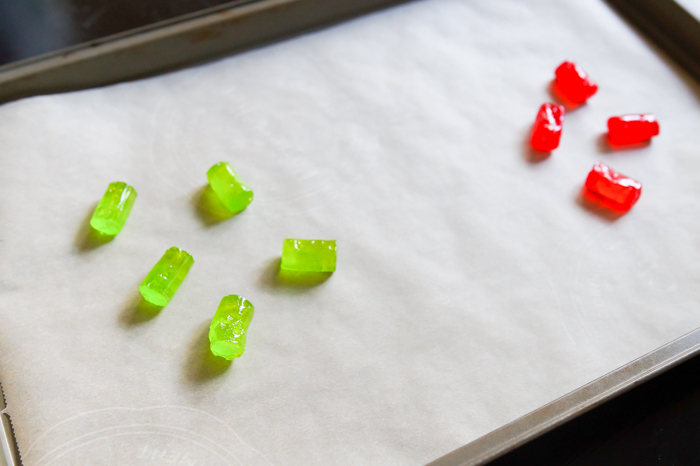 Meanwhile, I melted some Jolly Ranchers to make the "prism" edge. 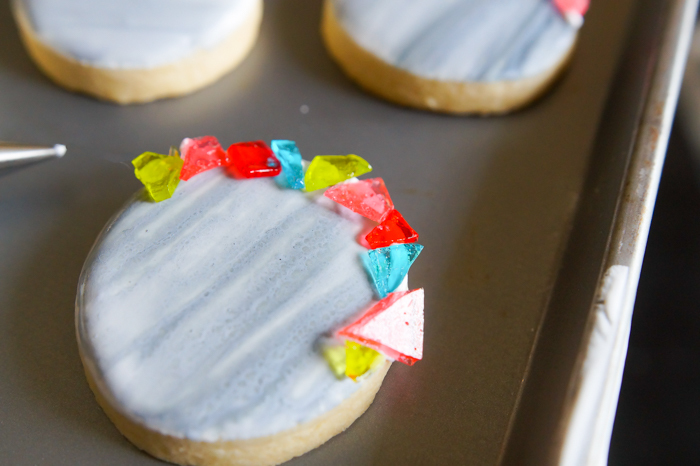 Place a few candies on a parchment-lined cookie sheet. Bake at 300 for 10 minutes. 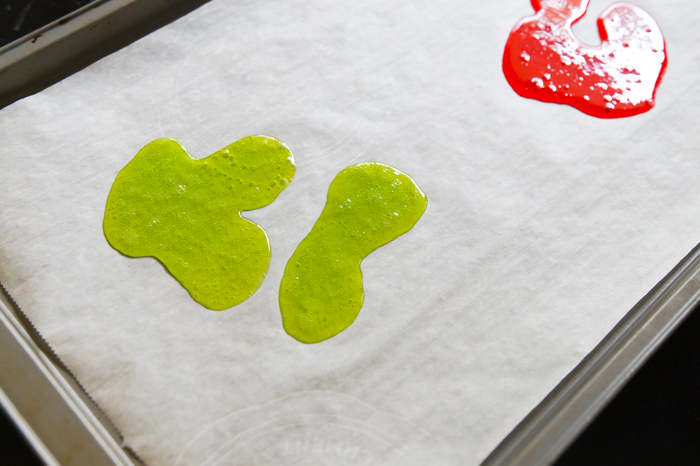 Remove the parchment from the cookie sheet and let cool completely. 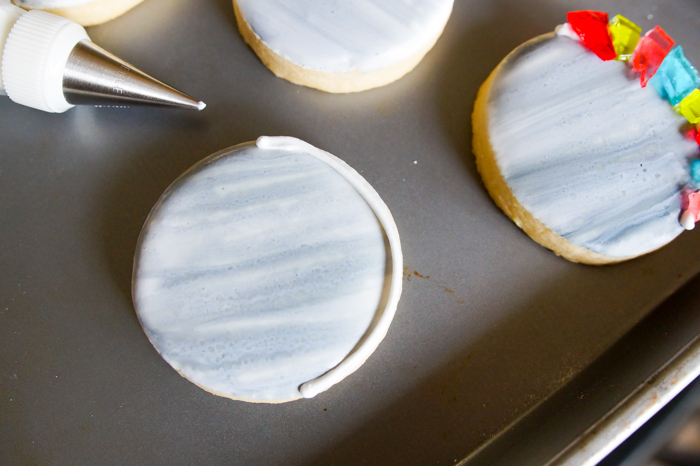 Pipe white royal icing along one edge of the cookies. 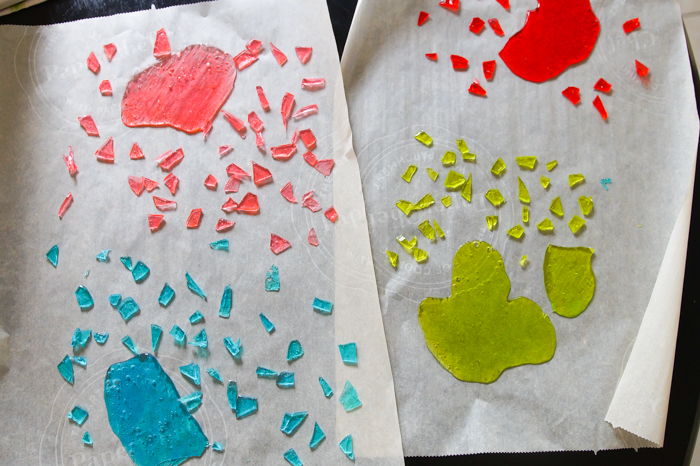 Break up the cooled candies and press onto the piped icing. 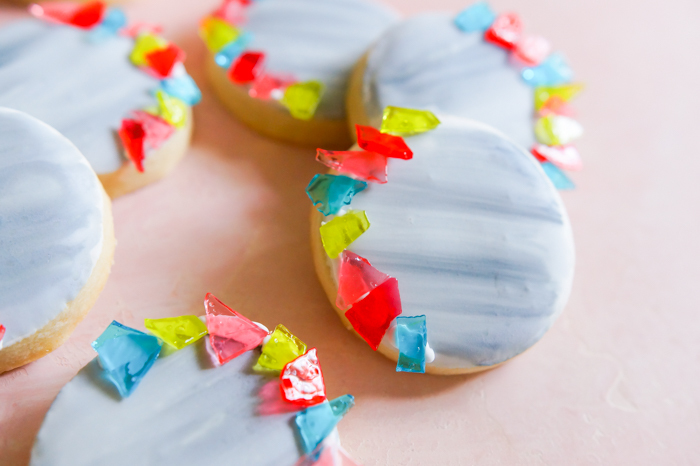 And, now you have yourself some weird migraine aura cookies! Hooray! I'd love to know...do you get migraines? Do you have the aura, too? What does yours look like? Wow! Yep! Pretty close!!!! My grow bigger and bigger as the migraine progresses... I take anti seizure meds to prevent getting up to 15 each month! Now I get about 1 a month! I'm so sorry you've dealt with them so often. Glad you have some good meds now, though! I get migraines and have the aura, but it's not colorful like this, just wiggly, shiny light movement. 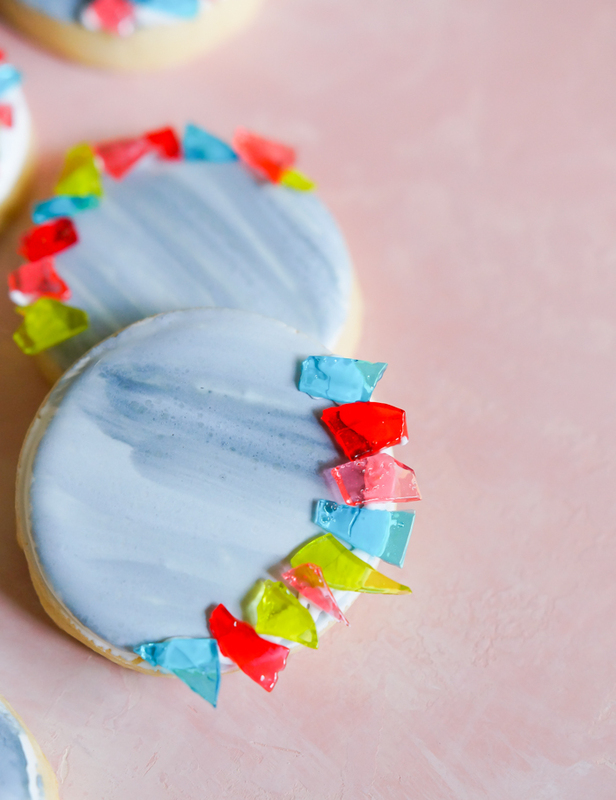 This is probably the most creative cookie I've ever seen! Way to turn a migraine into a beautiful piece of art!! Thank you! I don't know why I just had to make it into a cookie. I mentioned auras on twitter over the weekend and was fascinated by how different they all are. Spot on. I get the aura, but I've never had the full-blown migraine. Lucky me. My aura starts out small on the right side of my eye and gets larger as it moves across my field of vision and out of view. They are so weird, aren't they? Hope you dont have to deal with the migraines again. Prayers! I think are so cool... just easy and fun. Always love your cookies Bridget!! On another note.. omg, i LOVE Xanadu!!!! Seen it way too many times to say. I get migraines whenever the weather changes. I'm better than the weather wo/men! I take my medication and sleep 12-14 hours. I usually wake up with a "Hangover" but it's better than the migraine! In 35 years, I've only had one Aura. It's so good you know when they're coming on and what to do about them! Yay for good meds and sleep! I started getting migraines about 1 year ago, frequent smaller headaches and only two with an aura. It's always as if I'm staring directly into a bright light, in my left eye. I bet those beautiful cookies would take away at least a bit of the pain! I'm so sorry you're dealing with them. Those auras can be scary, cant' they? My aura is bright flashes of light in my left eye. I then get the nausea and headache, and if I am really lucky my entire left side will stop working properly from anywhere from a couple of days to over a month! Luckily it has only lasted that long once but I was beginning to wonder if it was going to be permanent that time. wow, very unique and creative, thank you for sharing how to do. I admit to loving Xanadu! I also get migraines with an aura about a 30-45 minutes before the pain starts. After years of trying different medications and nothing working, I was told to try Aleeve as soon as the Aura started. Bingo!! !It worked. I can continue to work with no pain. I've only had this type of migraine once. I was at work and thought I was having a stroke. It really freaked me out. My sister gets these (didn't know at the time) and she said it's called a visual migraine. Mine looked like that too, with colored aura. That's so funny that you bake your pain! LOL!